English physician and medical writer; born in London May 22, 1804; died there Jan. 20, 1853. He was educated at the Aldersgate General Dispensary and at St. Bartholomew's Hospital, graduating as apothecary in 1823, and receiving the degree of M.D. "honoris causa" from Erlangen University in 1840. For two years he was private tutor for pharmacological examinations. In 1826 he became lecturer on chemistry at the Royal College of Surgeons. 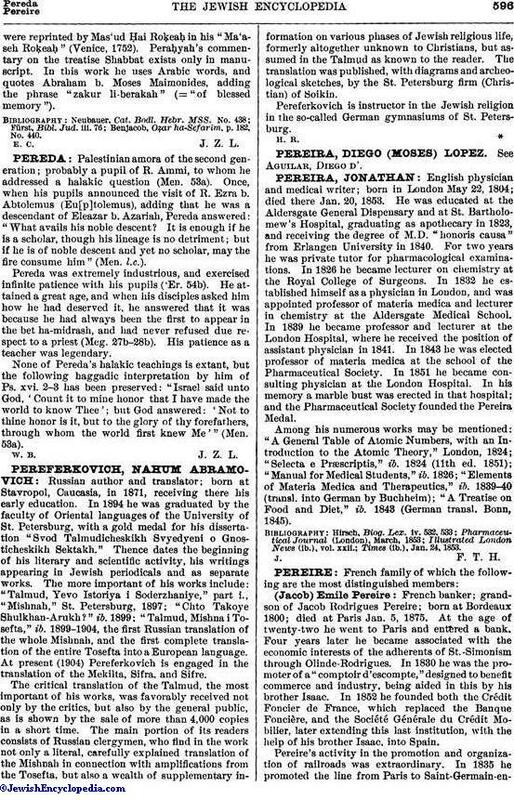 In 1832 he established himself as a physician in London, and was appointed professor of materia medica and lecturer in chemistry at the Aldersgate Medical School. In 1839 he became professor and lecturer at the London Hospital, where he received the position of assistant physician in 1841. In 1843 he was elected professor of materia medica at the school of the Pharmaceutical Society. In 1851 he became consulting physician at the London Hospital. In his memory a marble bust was erected in that hospital; and the Pharmaceutical Society founded the Pereira Medal. Among his numerous works may be mentioned: "A General Table of Atomic Numbers, with an Introduction to the Atomic Theory," London, 1824; "Selecta e Præscriptis," ib. 1824 (11th ed. 1851); "Manual for Medical Students," ib. 1826; "Elements of Materia Medica and Therapeutics," ib. 1839-40 (transl. into German by Buchheim); "A Treatise on Food and Diet," ib. 1843 (German transl. Bonn, 1845). Times (ib. ), Jan. 24, 1853.